Fallen on hard times? Hey, it happens to the best of us. You've bought one too many shrubberies, private island vacations, and real estate properties and now find yourself hurting for additional Simoleons. What is a Sim to do? I mean, it's not like you can sell a window or the wallpaper, right? Well, if your Sim isn't too proud, they can now beg for money. This self-interaction is cloned from the Freestyle interaction, so I'm marking it as needing Uni. It features a modified animation and interaction icon. 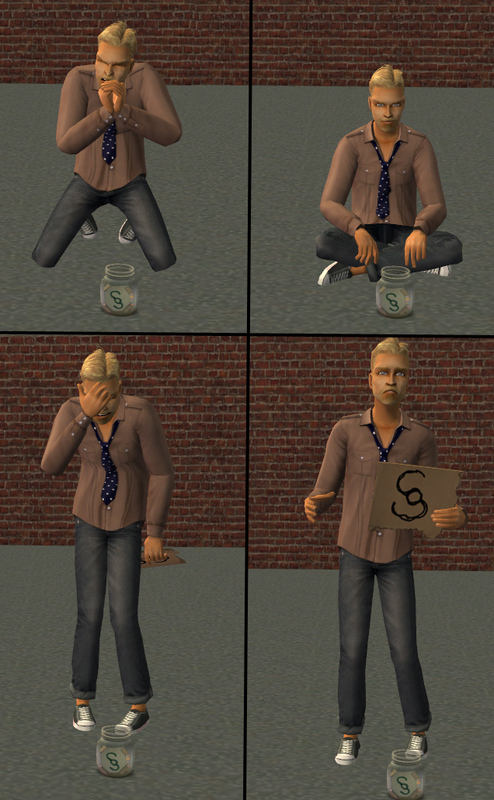 As with the Freestyle interaction and panhandling in general, your Sim is at the mercy of others' generosity. Good luck! It comes in three four five 6 flavors, but only choose one at a time. They share a GUID. 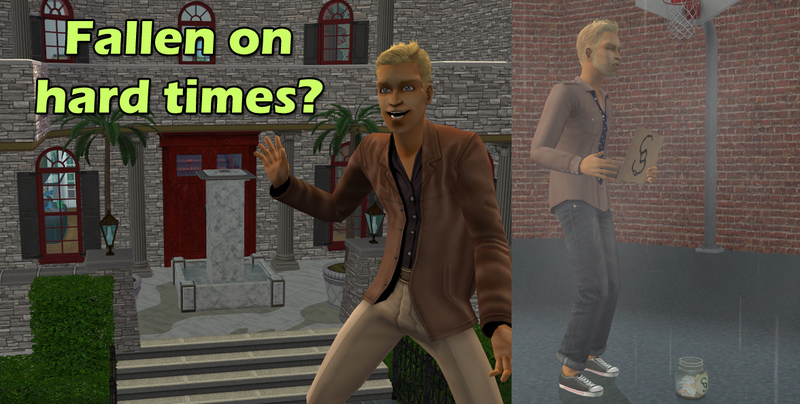 Begging_FortuneSimsOnly - This version is for all teens and above who have the Fortune/Wealth aspiration. Begging_MoneyLevel - This version is for all teens and above, but only when the household funds dip below a defined level. By default, this is $200 but you can edit the BCON to be whatever you wish. BeggingAlwaysEnabled - This version is for all teens and above, regardless of financial status or aspiration. BeggingMoochTrait_RequiresNLOrHigher - This version is for all teens and above, requires the Mooch trait in the Sim's inventory and Nightlife or higher (due to BHAV format). Begging_MoochTraitAndMoneyLevel - This version is like the Money Level version above but also requires the Mooch trait in the Sim's inventory and Nightlife or higher (due to BHAV format). Sims must have both the trait and have household funds be under the money limit. Begging_MoochTraitOrMoneyLevel - This version is like the Money Level version above but also requires the Mooch trait in the Sim's inventory and Nightlife or higher (due to BHAV format). Sims must have either the trait or have household funds be under the money limit. I made sure to zero-out the fallback GUIDs so you should be able to uninstall this without it causing the "Super Duper Hug" bug. As always, let me know of any issues or suggestions.